Oh What A Night: My sister and I had just returned to central Paris from a half day tour to Versailles. As we were coming back into town, we had seen the Eiffel Tower glimmering from a distance so we knew that we had to head there. After a taxi ride in which I feared for my life – we knew no French and the taxi driver didn’t (or wouldn’t) speak English but we somehow managed to tell her we wanted to visit the Eiffel Tower. We were driven through the streets of Paris at lightning speed and with little or no road rules – that I was aware of anyway, but we alighted safely at the base of the Eiffel Tower on Quai Branly to wait for the next time the tower lit up – about a 50 minute wait. Touters Beware: I don’t know if you have been to Paris but if you haven’t, you need to be aware of touters, gypsies and basically anyone trying to scam you. In the space of just two days we had been approached by a lovely man at the train station who I was sure was planning to take us away to a dark alley to murder us (he probably wasn’t but I was very wary); a woman on the street who pretended that we had dropped some jewelry in order to get a couple of Euro off us (I told my sister in no uncertain terms, to ignore these people); and of course saw the crowds of touters on the street trying to sell mini Eiffel Towers. So when we had gotten to the Eiffel Tower & had 50 minutes to kill, we were approached numerous times to buy these said goods. It got so bad that I (who very a rarely says the ‘f’ word) basically yelled at these people to “LEAVE US THE F**K ALONE. WE DON’T WANT TO F**KEN BUY ANYTHING!!! !” Whether they understood English or not, I am not sure but we didn’t get bothered for the rest of the evening. So Freaking Pretty: Nothing prepared me for seeing the Eiffel Tower at night. I mean, I had seen photos of course – one of my friends has a photo just like this – but nothing really prepares you for the moment that she lights up and sparkles. It is so amazingly pretty I can’t even put it into words. I will try though – spectacular, astounding, dazzling, magnificent, remarkable and just plain stunning. Final Thoughts: Whilst I didn’t love Paris, I would go back given the chance. But seeing the Eiffel Tower at night (actually even during the day she’s pretty amazing) was, and remains, one of my top travel moments. 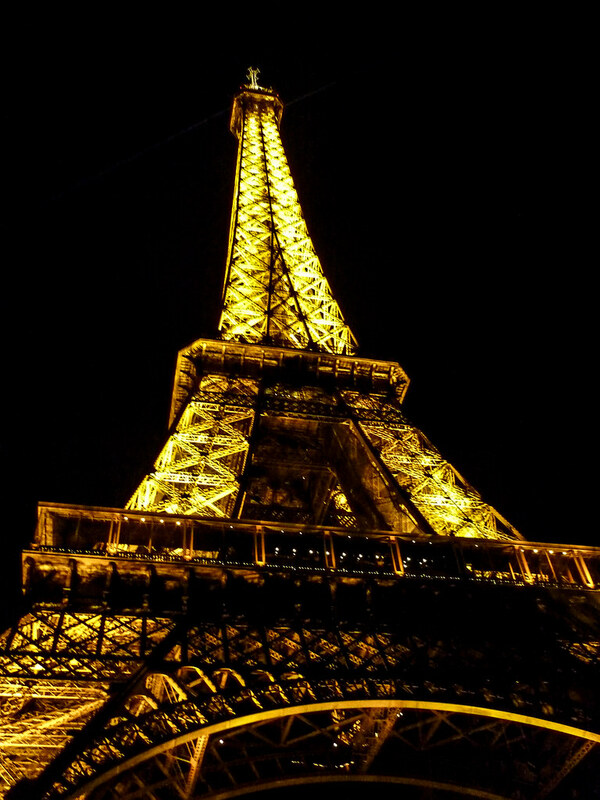 Have you seen the Eiffel Tower at night? Eiffel at night is gobsmacking alright, Sarah. I think I stood on the terrace facing it with my husband, both of us rendered speechless and it was a special moment. I have a similar shot of the tower at night and when I see it how the feeling, a curious thrill, rushes back to me. I know what you mean. It was just such an “I have no words for this moment” moment and after 7 years still makes me tingle just thinking about it!